I left my whisky notebook in my car and was on holiday without it. Damn. But, in Heathrow I just had a quick taste of a Laphroaig and thought I'd share my impressions. Nose: Soft, light peat, vanilla. A light one for Laphroaig. 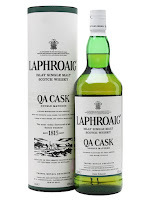 Taste: More intense taste, classic peat, very oily, vanilla, oak, bonfire, TCP. Finish: Medium length. Peat bonfire and soft vanilla. This was finished in 'fresh' American oak barrels. Not sure if they are virgin oak or 1st fill Bourbon. Id guess Bourbon from the colour. I'd rate this the same as the 10yo probably, lacking on the nose really.